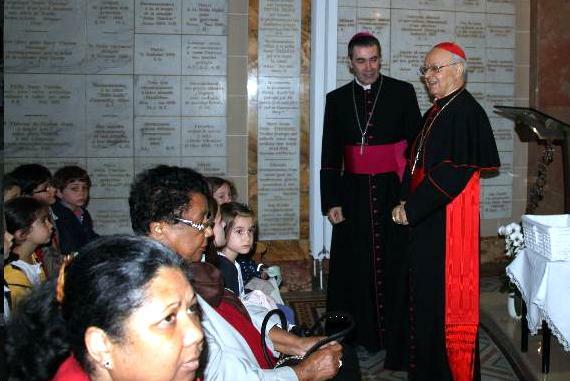 Cardinal Baldisseri, right, and Mgr Habert, bishop of Seez, left, with children in the chapel of the birthplace of St. Therese at Alencon, July 12, 2014. Photo credit: the Shrine at Alencon. The relics of St. Therese of Lisieux, of her blessed parents Zelie and Louis Martin, and of the blessed Quattrocchi spouses will be at Rome during the synod of the family (October 5-19, 2014)..
Cardinal Lorenzo Baldisseri, secretary-general of the synod of bishops, announced this at a press conference this morning, Friday, October 3, 2014, at the Vatican. As Pope Francis recently emphasized, the works of the synod fathers is to be accompanied by the prayer of all the baptized, the Cardinal declared. So, during the whole time of the synod, daily Eucharistic adoration is offered in the chapel of the Blessed Virgin, “Protectress of the Roman People” (Salus Populi Romani) of the Basilica of St. Mary Major. Times of prayer here will also be organized by the diocese of Rome. Each evening at 6:00 p.m., a bishop or a cardinal will celebrate Mass for the family, the secretary general explained. Further, he announced the presence of the relics of the blessed Martin spouses, of their daughter St. Therese of the Child Jesus, and of the blessed Italian spouses Luigi et Maria Beltrame Quattrocchi. All over the world, he added, prayers will be held in the shrines, especially those dedicated to the Holy Family, in the communities of consecrated life, in the dioceses, and in the parishes. ( October 3, 2014) © Innovative Media Inc.